If you're the kind of person who loves organization and efficiency, this return address label selection will be a great fit. A simple, yet symmetrical pattern features perfectly aligned tiny polka dots. It's an attractive finishing touch that isn't overly obnoxious. But what you'll really appreciate is how much easier this product makes the routine task of preparing outgoing mail. Forget about scribbling messy chicken-scratch on your letters and packages. Instead of writing out your return address, just stick on these self-adhesive labels and move on. 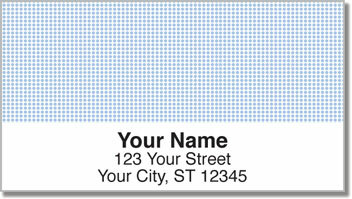 Get your very own Blue Dot Address Labels right now! This style can be ordered in several other color options. Plus, we also offer matching personal check designs.